Shishmaref is home to a small community of Inupiat, a Native American tribe. John is working with the Inupiat Tribal Government, the City of Shishmaref, and the Shishmaref Erosion & Relocation Coalition, to salvage as much of the village as possible before it goes under water and move it, along with the island inhabitants, to a new plot of land in the interior of Alaska. The Army Corp of Engineers gives the island about 5 or 10 more years of livability. 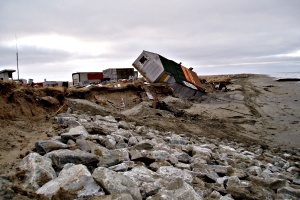 But as the ocean and permafrost warm and the ocean rises, unpredictable storms take a heavy toll on the island. “Each big storm with a high tide and an on-shore wind takes a big bite out of Sarichef,” says Woodward. The community is seeking funds for a comprehensive alternative energy plan, an anaerobic pump/methane generator, and the retrofit of all existing buildings, including more than 110 homes, community buildings and a school. The homes will be retrofit to use less than 5 Btu per square foot to heat. Heating load calculations can be pretty complicated, but in general, contractors recommend furnaces that can provide 30-50 Btu per square foot to heat homes in the Bay Area. To reach such a high level of energy efficiency, the Shishmaref homes will have the insulation installed on the outside of the structure, a technique that Woodward has successfully used in the past. The new village will have the look and functionality of the Inupiat culture as defined and designed through community planning. The Inupiat will build their new village to suit their needs and lifestyles, to be efficient, and to be in harmony with its surroundings-in other words, sustainabely. Let’s keep an eye on our northern neighbors, who may teach us some valuable lessons. How long before whole towns in California will have to relocate because of water shortages? We all witnessed what happened in New Orleans a few years ago. How long before towns and cities on the coast of California will have to move inland or be seriously reconfigured because of the rising Pacific Ocean? You can e-mail John Woodward with questions, comments, ideas, and offers of help at panuktuk@yahoo.com. Jim Gunshinan is the editor of Home Energy, the magazine of sustainable home building and renovation.